The New Year is upon us, and that means New Year’s resolutions. Every year I have a long list of things that never actually happen! I’m sure most people are like that. The thing is, goals, or resolutions, have to be attainable. I always say I want to eat healthier, but never set myself up to be successful. This year things are going to change. One of my goals this year is to eat healthier breakfasts. I am horrible about breakfast, half the time I don’t eat it at all. I’ve been looking for ways to create healthier breakfasts that aren’t going to take a lot of time or make a huge mess. My new favorite is Avocado Toast on Three Bakers 7 Ancient Grains bread. 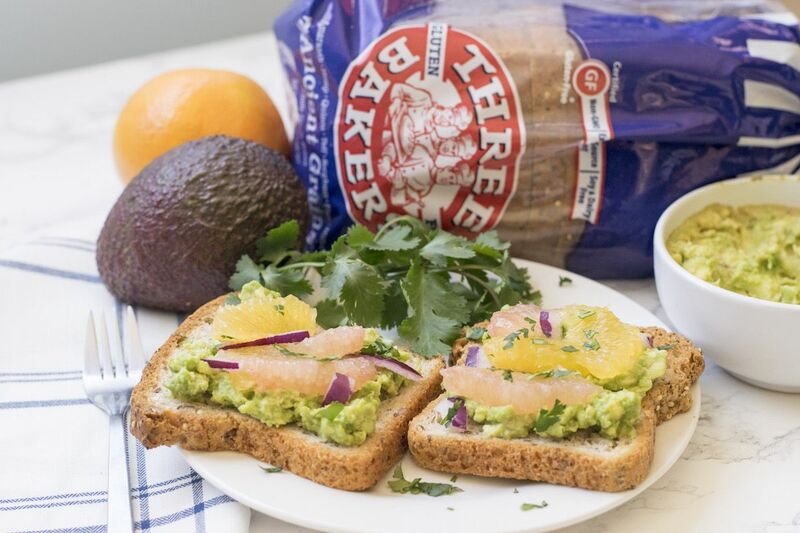 Avocados have all kinds of fantastic omega three’s in them, plus Three Bakers bread is packed with nutrients. The great thing is, you can have a lot of fun playing with your toppings, so it’s never dull. 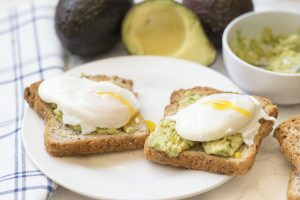 Some of my favorite ways to top avocado toast are with poached eggs, a light citrus salad, or pesto. So easy and so delicious. If avocado toast hasn’t become part of your breakfast routine, it’s time to add it in. Enjoy! Mash avocado with salt, pepper and lemon juice. If you have never poached an egg before, don’t fret. It’s simple! Just bring some water to a simmer and gently place your egg in the water. Let it cook for 3 to 5 minutes, or until the yolk is as hard or runny as you like it. Bring water to simmer in saucepan. Carefully place egg in water. Allow to cook 3-5 minutes, or until yolk is desired doneness. Citrus salad is another favorite topping. 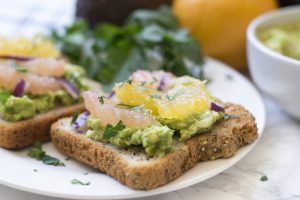 I love the citrus flavors with creamy avocado and toasty bread. I combine orange, grapefruit, red onion, and cilantro with a bit of salt and pepper and it is perfection. Pesto is also fantastic on avocado toast, but I cheat. My husband is allergic to basil, so I don’t ever keep fresh basil in the house. 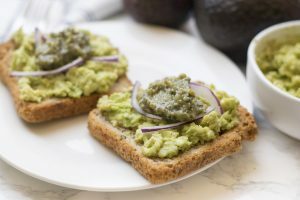 On occasion, I’ll buy a small container of pesto and add it to my avocado toast, with just a smidge of red onion! Sprinkle chopped onion over toast. 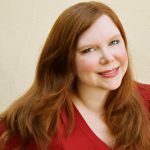 A former educator and administrator, Amanda now spends her time educating the public about Celiac Disease and Gluten Sensitivity. She believes eating gluten-free does not mean sacrificing flavor or budget. By creating tantalizing dishes and providing quality information on the gluten free lifestyle, Amanda aims to make a positive impact on the gluten-free community through her blog, My Gluten-Free Miami. Step by step recipes guide even the most novice cooks in creating innovative meals inspired by a unique blend of American and Peruvian favorites.